FF14 fans: here's where you'll be living this Summer. 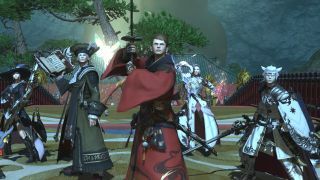 Just a couple of hours ago, Steven Messner detailed the new classes that will be added as part of Final Fantasy XIV's new expansion, Stormblood. It's an exhaustive read, and where you should head next after watching the following trailer, which shows off some of the expansion's new environments. Cor, FFXIV is a pretty game, and by the looks of it Stormblood will bolt on quite a few new environments, including a handsome desert area, some attractive temples, and the impressive city of Kugane. The new expansion will be out on June 20, and here's everything we know about it so far (minus Steven's hands-on impressions of the two new classes).